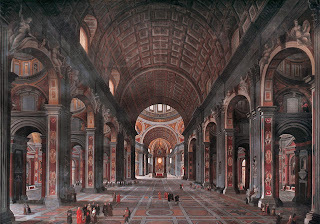 The Station for the Saturday of Ember Week is always at the great basilica erected by Constantine and rebuilt by the Popes in the sixteenth and seventeenth centuries on the hill of the Vatican on the spot where St. Peter died on the cross and where his body rests. 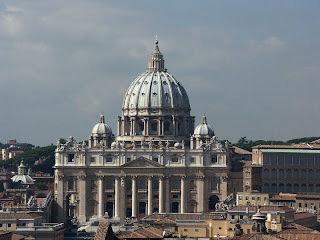 Besides the Gospel is about the Transfiguration of which St. Peter was the chief witness. It was in this basilica that ordinations took place, preceded, during the night, by twelve lessons of which we have a trace in those occurring in the Mass for to-day. The Introit verse alludes to this nocturnal vigil: "I have cried in the day and in the night before Thee." Like the Apostles selected to be present on Mount Thabor, at the manifestation of the divine life of Jesus (Gospel), the new Priests will ascend the steps of the altar to enter into communication with God. It is they who in His name will exhort us to prayer, to patience and to charity. If we abstain during Lent from even the appearance of evil, our souls and our bodies will be preserved unstained for the day of the eternal Pasch, when Christ (Epistle) will allow us to participate in the glory of His Transfiguration for all eternity. Let us pray to God to fortify us with His blessing so that, during this Lent, we may never depart from His holy will (Prayer over the People). Let my prayer come in before Thee: incline Thy ear to my petition, O Lord. * O Lord, the God of my salvation: I have cried in the day and in the night before Thee. May the blessing so desired confirm Thy faithful, O God, causing them never to depart from thy will, and ever to rejoice in Thy benefits. Dearly beloved, this Gospel Lesson calleth us to the understanding of a great mystery. And thereto we shall the more readily attain, by the grace of God, if we take into account the things which are recorded just before this passage. Wherefrom we see that the Saviour of mankind was careful to lay the foundations of the Faith whereby the ungodly are called to righteousness and the dead to life. To this end he instilled into the minds of his disciples, both by the doctrines which he taught and the miracles which he did, a belief in himself, the one Christ, as at once the Son of God, only-begotten, and the Son of Man. For one of these truths is of no use, as regards salvation, without the other. The danger is equally great of holding the Lord Jesus Christ to be God alone and not man, or man alone and not God. Both truths alike are to be confessed. For just as there is united with his Godhead true humanity, so also there is united with his humanity very Godhead. Therefore, to confirm their knowledge of this Faith, so necessary to salvation, the Lord had asked his disciples what, among the differing opinions of men, was their own belief and judgment as to what he was. Then the Apostle Peter, by the revelation of that Father who is above all, did rise above the experience of flesh and blood, and pass beyond the ken of man. Yea, he did fix the eyes of his mind upon the Son of the living God, and confess the glory of the Godhead, for he looked not on the substance of the flesh and blood only. And so well pleasing did he become by virtue of the loftiness of his faith, that he was rewarded with the joy of hearing himself called Blessed, and of being endued with a holy firmness, like unto a rock which cannot be moved. Founded on this, the Church was to prevail against the gates of hell and the laws of death; so that whatsoever Peter bound on earth, was bound in heaven, and whatsoever he did set loose on earth was set loose in heaven. But, dearly beloved, the loftiness of Peter's understanding, which the Lord praised, must needs rest on a foundation, and that foundation was the mystery of Christ's lower nature. Otherwise, the faith of the Apostle, carried away by the glorious acknowledgement of the Godhead in Christ, might deem it unworthy and unnatural for the impassible God to take into himself the frailty of our nature, and might thus believe that in Christ the humanity had been so glorified as to be no longer able to suffer pain, or be dissolved in death. And mark ye that when the Lord told how he must go up to Jerusalem, and suffer many things of the elders and chief priests and scribes, and be put to death, and rise again on the third day, it so happened that blessed Peter, bright with heavenly illumination, and still glowing from the passionate acknowledgement of the divine sonship, could not bear the mention of insulting mockery and cruel death, but spurned the same because of a natural, and, as seemed to him, a godly shrinking. Whereupon, by the merciful rebuke of Jesus he was corrected, and moved rather to desire to be a partaker in the sufferings of his Master.